The issue remains a complex, thorny one and agreement on it in Albany has been elusive. 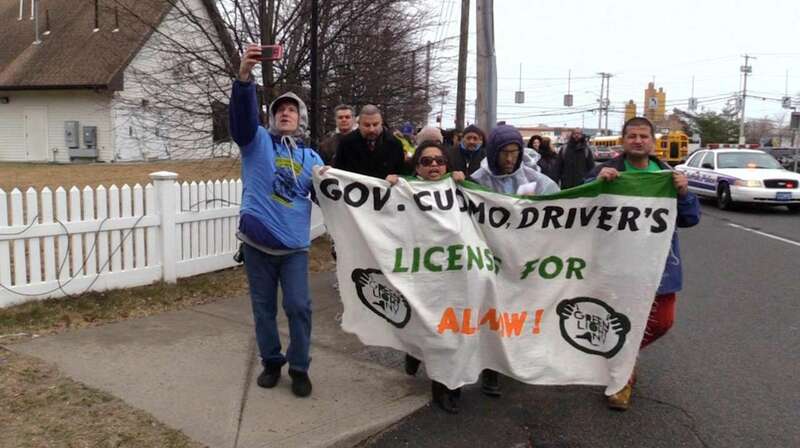 ALBANY — New York is again considering legalizing driver’s licenses for people who are in the country illegally, but the issue remains a thorny one for legislators and Gov. Andrew M. Cuomo and might not be done until the end of the session in June, if then. New York progressives don’t want to see the state falling behind, but the complexity of the issue is making agreement elusive. Q: Does current law prohibit those in the country illegally from obtaining driver’s licenses in New York? A: No. Through the 1990s, states had few if any restrictions. The 2001 terrorist attacks changed that. An executive order by former Gov. George Pataki that year is still in effect, which prohibits the distribution of driver’s licenses to these immigrants, as a safeguard against terrorists securing IDs. In 2007, Gov. Eliot Spitzer, with the support of some national anti-terrorism experts, tried to change that with an executive order, legislation and an administrative decree through the Department of Motor Vehicles, but all were met with strong opposition led by Republicans and county clerks. New York already has a license that could be used by those in the country illegally if a new bill passes. That license warns it is “not for federal purposes,” so it can’t be used to board aircraft or to visit secure federal sites. Q: Is legislation to legalize driver’s licenses for these immigrants expected to pass? A: Maybe. Progressive and Latino legislators have pushed for this measure, and last year during his re-election campaign Cuomo said he would sign a bill if it was passed. Cuomo, however, didn’t include the measure in his January State of the State speech, which includes most of his major priorities and sets the agenda for the legislative session. Now, there seem to be too many details unsettled at this point for a law to be included in the state budget deal, which is due by April 1. That could mean it is an issue that will be delayed to the remainder of the legislative session, which is scheduled to end June 19. Assemb. Felix Ortiz (D-Brooklyn), who has pushed for the idea the since 1998, said negotiations are currently “stuck,” as Cuomo seeks to get counties that operate state DMV offices on board. Neither bills in the State Senate nor Assembly bills have moved since January. Steven Choi, executive director of the New York Immigration Coalition, said its biggest focus is Long Island legislators. The group is expending dozens of door-to-door canvassing shifts and sending out mailings to help explain the benefits of the measure, he said. Q: What are the arguments to provide driver’s licenses to these immigrants? A: One main one is that driver’s licenses will help these immigrants get to schools, colleges, jobs and or day care. Supporters, including some anti-terrorism experts, also say putting more immigrants into public records will help combat terrorist activity while making the immigrants — who could be held accountable through their licenses — safer drivers. "For most New Yorkers, a driver’s license is a necessity of life — required to get to work, take kids to the doctor, and reach a supermarket to put food on the table," said Ann Toback from Worker’s Circle Action, a social justice Jewish organization. She said hardworking immigrants and those in school are being taken into custody in traffic stops and arrested, then face deportation because they can't get a driver's license. These immigrants are "forced to choose between providing for their families' needs and breaking the law." Q: Who opposes the measure? A: A Siena Research Institute poll released Monday found 61 percent of voters oppose the measure, compared to 34 percent who support it. The strongest support was among Democrats, where 49 percent favor the action compared to 45 percent opposed, in the poll with a margin of error of plus or minus 4.2 points. “We need security, we need lots of it,” said Sen. James Tedisco (R-Schenectady), who led opposition to the bill in 2007 and today. He said a driver’s license is a basic form of identification that will allow immigrants who came the United States illegally to enter sensitive sites and to apply for additional state and local services such as health care and education. Q: How would an applicant prove identity? A: A bill by Assemb. Marcos Crespo (D-Bronx) would allow applicants to use immigration papers or papers from their home country to apply for a driver’s license when they don’t have a Social Security number, which most New Yorkers use. Crespo’s bill, however, would prohibit federal immigration enforcers to access to the records used so they couldn’t be used to deport the new driver.